Microsoft announced their Windows Home Server Power Pack 3 Beta this week. The update includes better Windows 7 support, improved netbook support and some nice new features for Microsoft Media Center users. It doesn’t allow you to use WHS as your one, MediaCenter “server”, but it is a step in the right direction. The MediaCenter bloggers were abuzz yesterday about the new WHS Media Center features so we’ll focus on those today. First you’ll need to install (or update) the Windows Home Server Connector software on your Windows Media Center PC. 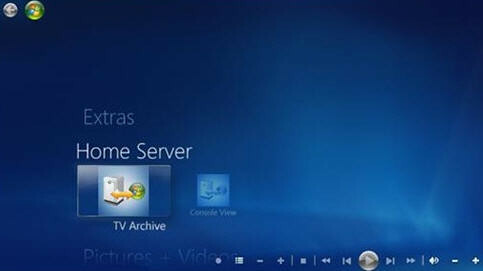 Once installed, you’ll notice a new Home Server selection in Windows Media Center menu. You will now have Music, Photos and Videos shared folders from the WHS available to Windows 7 Libraries. This makes that content available for Windows Media Center as well as other Windows applications like Windows Explorer, Windows Media Player and others that use Windows 7 Libraries. A new Media Center menu option on the main menu of Media Center called “TV Archive.” This menu item allows you to transfer recorded TV programming to your WHS machine. There is an option to select individual shows or entire series. A nice feature is the ability to transfer future, scheduled episodes of a given show as well. As part of the “Move TV Recordings” function described above, you can also choose to compress/transcode those shows to save hard drive space. That includes compression into Zune and other portable media formats. A new Media Center menu option on the extras menu to View WHS stats. Stats include: Storage available, hard drive stats, computers being backed up & their status, list of shared folders, media count, network health, and home server hardware & manufacturer info. Windows Search 4 implemented for faster search and indexing times. Better WHS support for netbooks with low resolution screens. If you would like to see the new WHS features for MediaCenter in action, check out this post by Adam at theDigitalMediaZone.com for a nice screencast. I love the new updates this beta brings to WHS – especially the Media Center-centric updates. But it’s only a good first step. To make the WHS a true, Media Center Server, it really needs to be able to be the one, single Media Server for the entire HTPC setup – think WHS = digital media hub. What I mean by that is this: Microsoft needs to enable WHS to be the HTPC server for the home. This means allow the tuners to be installed on the WHS computer and not require another computer to do the MediaCenter work. Then you could add on one or more extenders to the setup without needing another PC. And if Microsoft implemented softsled (using a PC as an extender) it would be that much better. SageTV has been doing this with their SageTV WHS software since 2007! Yes, 2007 and there are many happy SageTV owners using their Windows Home Server computers just like this. That is the ideal I think Microsoft should be going for with WHS – no not everyone will use it that way, but what better way to leverage two Microsoft products to build synergies!